Gluten Free Stuffing or Dressing To begin my stuffing I like to start preparing now. So first I make my croutons. 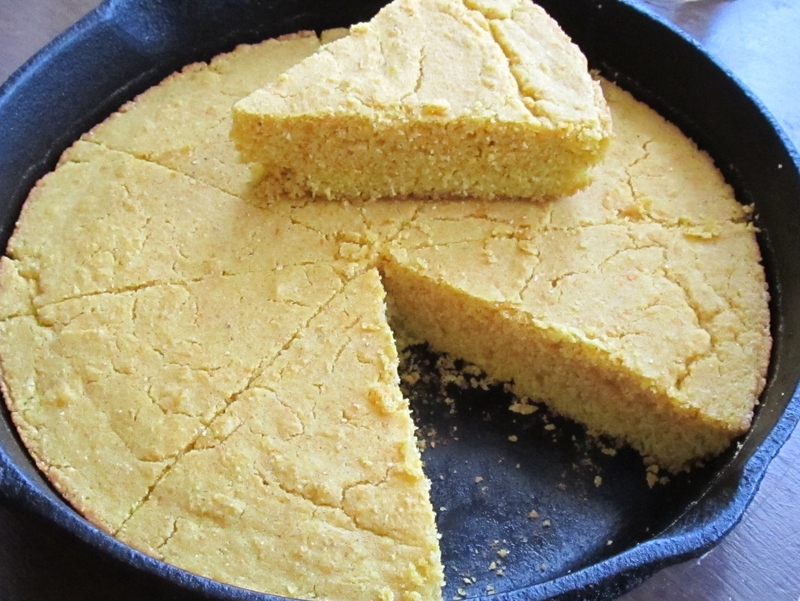 Then I make my the cornbread. That way I only need to assemble the stuffing on Thanksgiving. I use leftover Gluten Free bread if I can, and I like to save the ends for croutons also. But if you need several cups at a time, one 9×4 inch loaf will make about 4- 5 cups of baked croutons. To cut each slice into small crouton size squares, I usually stack the slices of bread, then cut so it goes faster. And spread the little squares on a cookie sheet, or baking pan one layer thick. Sprinkle on garlic powder and salt, and bake. About 20 – 25 minutes or until crisp. Make sure to check them at about 15 minutes, they will need to be stirred. When done, let them cool, and store in an air tight container in the freezer until needed. To use in a salad, take out what you need and microwave about ten seconds. Or save them for stuffing. My dressing (or stuffing) recipe calls for 4 cups of croutons. 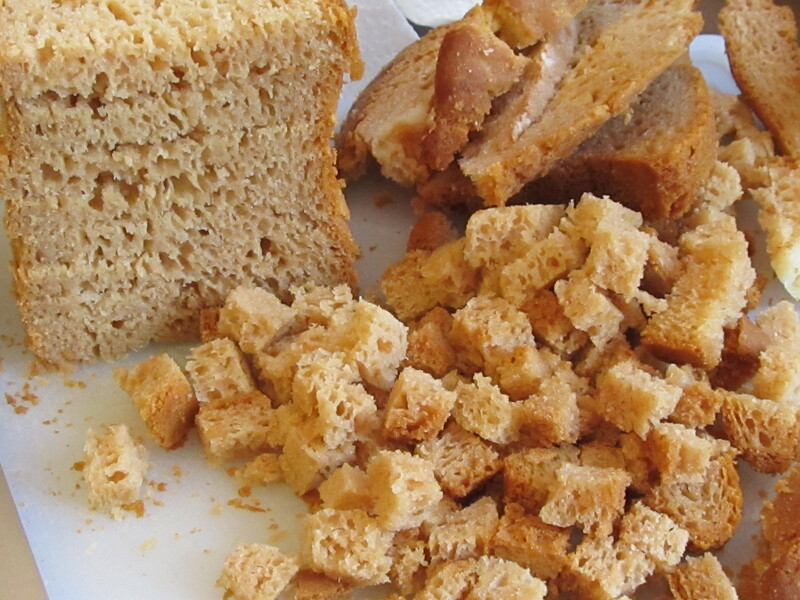 My baking pans will hold 2 ½ cups of cubed bread at a time, which equals (after shrinkage) 2 cups of croutons. So after baked and cooled the 2 ½ cups will shrink to about 2 cups. In large sauce pan melt butter, and add onions, garlic, and celery, sauté until onions are translucent. Add chicken broth, salt, pepper, GF chicken soup and sage, until soup melts do not boil. 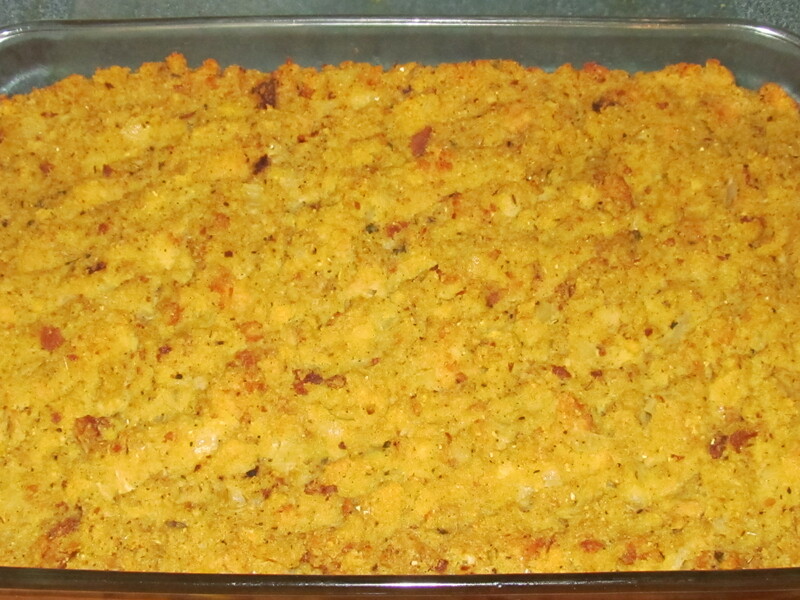 In large mixing bowl, crumble cornbread and add croutons. Pour onion and broth mixture over bread, (make sure broth & drippings is not too hot to cook eggs) add beaten eggs and turkey drippings. Mix well and add to turkey roasting pan. (as per directions above) Or if you would rather not stuff the turkey with dressing, you can always bake the dressing independently, at 325* for 40 – 45 minutes. This will fill 2, greased 9×13 pans, and will feed a large gathering for the holidays. When I make dressing for us during the year, not on any holiday. I half the recipe and buy a small 1 – 1 ½ pound turkey breast, thaw it, wash it well and slice it into about ½ inch x 2 inch shreds and add it to the onion and chicken broth mixture to cook. Only when you add the frozen GF cream of chicken soup, go ahead and add the whole container. Then you must let the mixture come to a boil to help cook the turkey pieces. Let this cool before adding to bread and both beaten eggs. Bake as above in one greased 9x 13 pan.